On the left, an immunofluorescent light micrograph of a retinal cross-section. Photoreceptor and bipolar terminals are shown in blue (labeled with VGLUT1), off-cone bipolar terminals are shown in red (labeled with synaptotagmin-2, and on-bipolar cells are shown in green (labeled with G-gamma-13). On the right, shown in my lab office is a quilt my mom designed and made called Shannon's Eye of the Storm which features the micrograph on the left in the central pupil. When I'm not in my studio sewing or designing, I can usually be found in the lab at the University of Oklahoma Health Sciences Center. My training is in pharmacology, but my current research and teaching efforts are focused on the cell biology and biochemistry of vision. We are interested in the pathogenic mechanisms that underlie multiple different forms of inherited blindness, including retinitis pigmentosa, macular dystrophy, and pattern dystrophy. These are all diseases that affect the retina, the tissue in the back of the eye responsible for sensing light and converting it into a chemical signal that can be sent to the brain and processed as vision. My research often finds its way (directly or indirectly) into my art, and I love to share it with those who are interested, so e-mail me if you have questions! 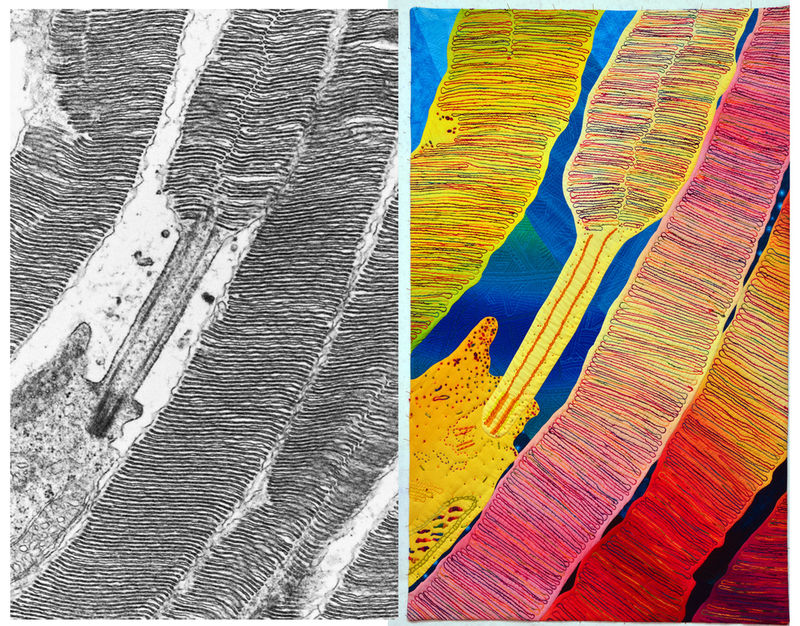 On the left is a transmission electron micrograph of murine rod photoreceptors captured by my friend Barb Nagel, and on the right, my quilt "Do You See What I See" is my colorful interpretation of it. Specifically, I'm interested in understanding the role of photoreceptor tetraspanins in rod and cone outer segment morphogenesis. Two tetraspanins in particular, RDS (retinal degeneration slow) and ROM-1 (rod outer segment membrane protein 1), are known to be required for the morphogenesis and stability of rod and cone photoreceptor outer segments. Of particular interest to us are the underlying mechanisms which contribute to rod-dominant or cone-dominant retinal degeneration in patients with RDS mutations. We utilize models of RDS-associated retinitis pigmentosa and macular dystrophy to study the development of disease and to test novel, non-viral genetic therapies designed to correct the underlying genetic defect. For more on the projects I'm involved in, you can find my academic publications on pubmed.